This post is about four weeks overdue. I've been cooking, but I haven't been writing. It feels good to put the proverbial pen to paper. After about 10 days of actual spring weather, tonight, the rain is beginning to fall. I'm eating a leftover pasta dish that probably won't win a spot on the front page of Oakland Skillet. Tonight just feels like a good night for blogging. Girlfriend's Mother: "Have you been to a Sader before?" Girlfriend's Mother: "Have you been invited to a Sader this year?" Me: "No. But if that is an invitation to yours then I accept." (Two days pass) I realize that I didn't actually wait for an invitation and kind of stuck my foot in the door. It turns out it was more or less an invitation, but it does point out where I might lack some social graces, but I digress. Along with the invitation came a "challenge", or at least I took it as a challenge. I was asked to bring a traditional Ashkenazi-Jewish stew called Tzimmes. Traditionally the stew is made with carrots and dried fruit, but other root vegetables are often added. I had about a week to research the dish and come up with a recipe. I found many variations, but having never eaten Tzimmes before I felt I had a little free license. 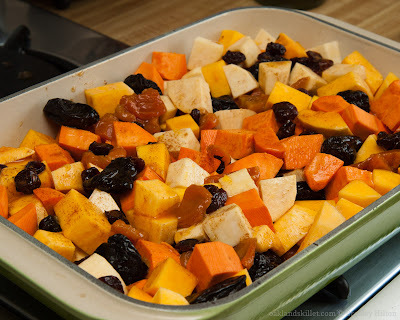 I loved the idea of using dried fruit with sweet potatoes and yams. 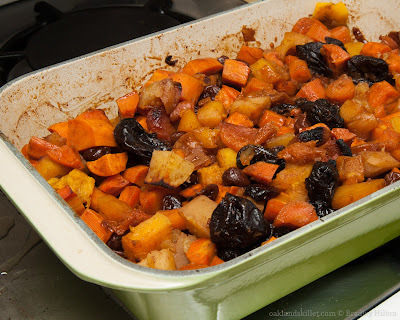 I was reminded of my step-mothers recipe for baked yams with bourbon spiked apricots. After reading more about the dietary rules for passover I'm not sure the bourbon was appropriate, but the combination of flavors is magnificent. Besides, Tzimmes is more traditionally served in the Fall during Rosh Hashanah when bourbon is probably okay (don't quote me on that). My version also adds dried cherries along with more traditional raisins, and prunes. I was quite pleased with the outcome of my Tzimmes recipe. I think the addition of dried cherries and bourbon soaked apricots made this my own rendition. Soak the apricots in the bourbon for 4 - 12 hours. Drain the apricots and reserve the liquid. Oil a large oven proof baking dish. Place the carrots on the bottom of the dish. In a large bowl combine the sweet potatoes, yams, prunes, cherries, raisins, and apricots. Stir to distribute the ingredients evenly then add to the baking dish. Try to keep the carrots on the bottom of the dish. Combine the orange juice, water, honey, cinnamon, and ginger. It may help to dissolve the honey in warm water and then add the orange juice. Pour the mixture evenly over the vegetables in the dish. Add 1 - 2 tablespoons of the reserved bourbon if you like. Cover the dish and bake at 350º F for 45 minutes to 1 hour. Remove the cover and stir the vegetables carefully so the carrots are evenly distributed among the mixture. Bake for 45 - 50 minutes longer or until the carrots are tender but not mush and most of the liquid has evaporated. Remove the dish from the oven and stir the vegetables gently to coat the vegetables with the reduced liquid at the bottom of the dish. This serves a lot of people maybe 8 - 10. Notes: Originally when I made this dish I added butternut squash, but I don't think I'll do that again. It just had the wrong texture. This dish would also be a great Thanksgiving dish. In a recipe I read later it was suggested that you add butter after the cover is removed. This seems like a good idea. I will try that when these roots really get back in season.